This week is National Farriers Week which means celebrating the work of farriers everywhere and spreading the word about the importance of good hoof care. The horse’s hoof tells a story; in fact, the Arabs believed that a horse was nothing without a sound hoof to stand on. When you think that the hooves bear the entire weight of the horse – all 1,000 pounds of it – over a small surface area, it is not hard to see why this might be true. 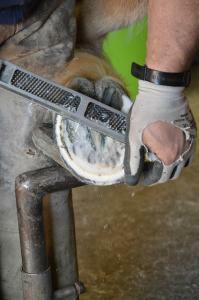 As most people know, farriers specialise in equine hoof care. They shoe, trim and balance the hooves when necessary, and usually on a routine basis of every 6 weeks (if you ride on particularly abrasive ground, your horse will need shoeing more often). Your horse's hooves grow at a similar pace to your fingernails, lengthening by 1/4 of an inch every month. If they are not trimmed regularly, the hoof can crack and break apart, leaving your horse unbalanced. Farriers are often the first to notice early hoof changes indicative of injury or disease, and can adjust shoeing to varying ground surfaces, training, racing and cosmetic purposes. It is worth using the same farrier for all your horses’ hoof care and shoeing needs as he will be familiar with your equines' unique hoof conformations and will recognise problems before they occur. If you have a farrier that goes above and beyond to help your horses in a crisis, please comment below telling us why your farrier needs celebrating! Now, let's think about hoof care. Ensuring your horse's hooves are in tip top condition is not just the responsibility of your farrier. There are many things you can do on a daily basis to safeguard your horse's most valuable assets. If your horse does encounter hoof problems, both its health and mobility can be affected. Historically, before horses were domesticated they roamed freely over varying terrain. This lifestyle lent itself to the maintenance of the hoof as it was continually being strengthened and its growth matched its wear. Semi-arid terrain was healthy for the foot and promoted soundness and balance. But the feral lifestyle and the quality of hooves before is a far cry from the hooves of domesticated horses today. Nowadays, the majority of horses wear shoes to protect and strengthen the feet. Going barefoot is not really an option for most of our faithful steeds as regular stabling and exercise on soft ground means the hooves are not worn down naturally to compensate for their fast growth. If the hoof grows too much before being trimmed, the horse will quickly become unbalanced and lame. Choosing the right type of shoe is also important as 'no shoe fits all.' Depending on how your horse is worked or ridden, and the type of terrain and stabling, your horse will require different levels of traction and support. Too much or too little can cause joint and ligament injuries so it is vital your horse is properly supported by its shoes. Hoof health is often a matter of genetics, with the mare and stallion determining the quality of the foot. When buying a horse, take this into account. The hooves should be clean, well-rounded and without visible problems such as cracks, abscesses etc. The animal might have a pretty head but if its hooves are poor, you're not onto a winner! The hooves can quite literally make or break a horse and treating an existing problem can be difficult and expensive. So, what can be done to ensure the health and condition of your horse's hooves? - Besides keeping a close eye on your horse's feet to notice any changes, keeping the hooves clean and free from compacted mud, manure and stones is imperative. Horses spend most of the time on their feet so their hooves are rarely free of debris. In winter, wet mud can stick to the inside of the hoof and heel, placing pressure on the sole and causing inflammation and mud fever. Thrush and bacterial infections thrive in these conditions and get worse if the hoof isn't regularly cleaned and treated. Find time every day to pick the hooves. Gently pry off any dried mud and foreign matter and examine the hoof closely. You can only do this once the hoof is completely clean. When examining the hooves, look for signs of bruising, infection, swelling and cracks. If your horse has thrush you will notice a thick white substance that looks a bit like ricotta cheese. - The next thing to think about is where your horse is stabled. In a stable your horse is more likely to tread on its own defecation and stand there for long periods of time. Keep the stable quarters as clean as possible by raking together manure on a daily basis. Straw is a great cushioning for a horse to rest on and will also absorb and cover stools. - If the hooves become dry during summer, some people like to use hoof oil to give added moisture. Although the benefits of this are disputed, hoof oil is a great 'finisher' that adds shine to the hooves and gives a polished look for competition and showing. Some farriers recommend sloshing water over the hooves to add moisture, as long as this is done in summer when the ground is dry and not in winter when the ground is soft, wet and muddy. - Supplements targeted at improving hoof strength and appearance are also recommended by many. VioVet sells a great range of hoof care supplements, dressings and topical solutions for preventing hoof problems and managing existing ones. To view what VioVet has to offer, click here. My farrier, Nigel Johnson, alway goes the extra mile to provide information about the hoof, problems with it and treatment; he uses drawings, his half-foot that he carries in his truck or even the horse leg that he keeps in his freezer if he is freely helping Pony Club members to understand more about why the hoof is so important. For Nigel, being a farrier is not just a job but his life.